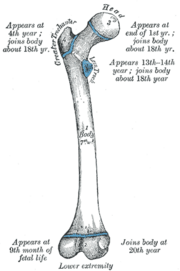 Gray's Anatomy illustration of a human femur. Bones are semi-rigid, porous, mineralized organs, consisting of cells in a hard matrix, that form part of the endoskeleton of vertebrates. Bones function to move, support, and protect the body, produce red and white blood cells, and store minerals. Although externally bones may appear to be simple and even solid structures, in reality they are composed of living bone tissue interlaced with blood vessels, nerve fibers, and so forth, and their formation, structure, and function involves stunningly complex coordination. Bones come in a variety of shapes and have a intricate internal and external structure, allowing them to be lightweight yet strong and hard, while fulfilling their many other functions. One of the types of tissues that make up bones is the mineralized osseous tissue, also called bone tissue, a specialized connective tissue that gives bones their rigidity and honeycomb-like, three-dimensional internal structure. Other tissue types found in bones in their entirety include marrow, the periosteum, nerves, blood vessels, and cartilage. Because a group of tissues are involved that perform a specific function or group of functions, bones can be referred to as organs, although bone tissue is the dominant tissue, leading bone to often be classified as a specialized type of connective tissue. All bones consist of living cells embedded in the mineralized organic matrix that makes up the osseous tissue. The primary tissue of bone, osseous tissue, is a relatively hard and lightweight composite material, formed mostly of calcium phosphate in the chemical arrangement termed calcium hydroxylapatite (this is the osseous tissue that gives bones their rigidity). It has relatively high compressive strength but poor tensile strength, meaning it resists pushing forces well, but not pulling forces. While bone is essentially brittle, it does have a significant degree of elasticity, contributed chiefly by collagen. Collagen is the main protein of connective tissue in animals and involves the harmonization of three polypeptide chains into the form of a triple helix. It is characterized by the regular arrangement of amino acids in each of the three chains; under tension, the triple helix coils tight, resisting stretching, and making collagen valuable for structure and support, while giving bones some elasticity. Bone is not a uniformly solid material, but rather has some spaces between its hard components. The hard outer layer of bones is called compact bone tissue due to its minimal gaps or spaces. This tissue gives bones their smooth, white, and solid appearance, and accounts for 80 percent of the total bone mass of an adult skeleton. Compact bone may also be referred to as dense bone or cortical bone. Filling the interior of the organ is the hole-filled spongy bone tissue (also called cancellous bone or trabecular bone) which is comprised of a network of flat or needle-shaped trabeculae, which makes the overall organ lighter and allows room for blood vessels and marrow. 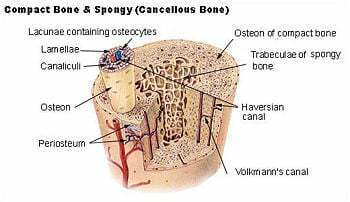 Spongy bone accounts for the remaining 20 percent of total bone mass, but has nearly ten times the surface area of compact bone. The exterior of bones (except where they interact with other bones through joints) is covered by the periosteum, which has an external fibrous layer, and an internal osteogenic layer. The periosteum is richly supplied with blood, lymph, and nerve vessels, attaching to the bone itself through Sharpey's fibers. Bone can also be either woven or lamellar (layered). Woven bone is weak, with a small number of randomly oriented collagen fibers, but forms quickly and without a preexisting structure during periods of repair or growth. Lamellar bone is stronger, formed of numerous stacked layers and filled with many collagen fibers parallel to other fibers in the same layer. The fibers run in opposite directions in alternating layers, assisting in the bone's ability to resist torsion forces. After a break, woven bone quickly forms and is gradually replaced by slow-growing lamellar bone on preexisting, calcified hyaline cartilage through a process known as "bony substitution." There are seven main functions of bones. Protection: Bones can serve to protect internal organs, such as the skull protects the brain or the ribs protect the abdomen. Shape: Bones provide a frame to keep the body supported. Blood production: The bone marrow, located within the medullary cavity of long bones and the interstices of cancellous bone, produces blood cells in a process called haematopoiesis. Mineral storage: Bones act as reserves of minerals important for the body, most notably calcium and phosphorus. Movement: Bones, skeletal muscles, tendons, ligaments, and joints function together to generate and transfer forces so that individual body parts or the whole body can be manipulated in three-dimensional space. The interaction between bone and muscle is studied in biomechanics. Detoxification: Bone tissue removes heavy metals and other foreign elements from the blood and thus reduces their effects on nervous and other tissues. It can later release these more slowly for excretion. Most bones perform all of these functions to one degree or another, but certain bones are more specialized for certain functions. Long bones are longer than they are wide, consisting of a long shaft (the diaphysis) plus two articular (joint) surfaces, called epiphyses. They are comprised mostly of compact bone, but are generally thick enough to contain considerable spongy bone and marrow in the hollow center (the medullary cavity). Most bones of the limbs (including the three bones of the fingers) are long bones, except for the kneecap (patella), and the carpal, metacarpal, tarsal, and metatarsal bones of the wrist and ankle. The classification refers to shape rather than the size. Sesamoid bones are short bones embedded in tendons. Since they act to hold the tendon further away from the joint, the angle of the tendon is increased and thus the force of the muscle is increased. Examples of sesamoid bones are the patella and the pisiform. Osteoblasts are mononucleate bone-forming cells which descend from osteoprogenitor cells. They are located on the surface of osteoid seams and make a protein mixture known as osteoid, which mineralizes to becomes bone. Osteoid is primarily composed of Type I collagen and manufactures hormones, such as prostaglandins, to act on the bone itself. They robustly produce alkaline phosphatase, an enzyme that has a role in the mineralization of bone, as well as many matrix proteins. Osteoblasts are the immature bone cells. Osteocytes originate from osteoblasts, which have migrated into and become trapped and surrounded by bone matrix which they themselves produce. The spaces which they occupy are known as lacunae. Osteocytes have many processes which reach out to meet osteoblasts probably for the purposes of communication. Their functions include to varying degrees: formation of bone, matrix maintenance and calcium homeostasis. They possibly act as mechano-sensory receptors—regulating the bone's response to stress. They are mature bone cells. The process of bone resorption releases stored calcium into the systemic circulation and is an important process in regulating calcium balance. As bone formation actively fixes circulating calcium in its mineral form, removing it from the bloodstream, resorption actively unfixes it, thereby increasing circulating calcium levels. These processes occur in tandem at site-specific locations and are known as bone turnover or remodeling. Osteoblasts and osteoclasts, coupled together via paracrine cell signaling, are referred to as bone remodeling units. The iteration of remodeling events at the cellular level is influential on shaping and sculpting the skeleton during growth and in response to stress (such as weight-bearing exercise or bone healing). The matrix comprises the other major constituent of bone. It has inorganic and organic parts. The inorganic is mainly crystalline mineral salts and calcium, which is present in the form of hydroxyapatite. The matrix is initially laid down as unmineralized osteoid (manufactured by osteoblasts). Mineralization involves osteoblasts secreting vesicles containing alkaline phosphatase. This cleaves the phosphate groups and acts as the foci for calcium and phosphate deposition. The vesicles then rupture and act as a center for crystals to grow on. The organic part of matrix is mainly Type I collagen. This is made intracellularly as tropocollagen, and then exported. It then associates into fibrils. Also making up the organic part of matrix are various growth factors, the functions of which are not fully known. Other factors present include glycosaminoglycans, osteocalcin, osteonectin, bone sialo protein, and Cell Attachment Factor. One of the main things that distinguishes the matrix of a bone from that of another cell is that the matrix in bone is hard. The formation of bone during the fetal stage of development (in humans, after the 7th or 8th week until birth) occurs by two methods: Intramembranous and endochondral ossification. Endochondral ossification begins with points in the cartilage called "primary ossification centers." They mostly appear during fetal development, though a few short bones begin their primary ossification after birth. They are responsible for the formation of the diaphyses of long bones, short bones, and certain parts of irregular bones. Secondary ossification occurs after birth, and forms the epiphyses of long bones and the extremities of irregular and flat bones. 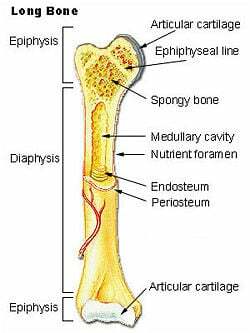 The diaphysis and both epiphyses of a long bone are separated by a growing zone of cartilage (the epiphyseal plate). When the child reaches skeletal maturity (18 to 25 years of age), all of the cartilage is replaced by bone, fusing the diaphysis and both epiphyses together (epiphyseal closure). Bone marrow can be found in almost any bone that holds cancellous tissue. In newborns, all such bones are filled exclusively with red marrow (or hemopoietic marrow), but as the child ages it is mostly replaced by yellow, or "fatty," marrow. In adults, red marrow is mostly found in the flat bones of the skull, the ribs, the vertebrae, and pelvic bones. "Remodeling" is the process of resorption followed by replacement of bone with little change in shape and occurs throughout a person's life. Its purpose is the release of calcium and the repair of micro-damaged bones (from everyday stress). Repeated stress results in the bone thickening at the points of maximum stress (Wolff's law). The study of bones and teeth is referred to as osteology. It is frequently used in anthropology, archaeology, and forensic science for a variety of tasks. This can include determining the nutrition, health, age, or injury status of the individual the bones were taken from. Preparing fleshed bones for these types of studies can involve maceration—boiling fleshed bones to remove large particles, then hand-cleaning. Anthropologists and archaeologists also study bone tools made by Homo sapiens and Homo neanderthalensis. Bones can serve a variety of uses, such as projectile points or artistic pigments, and can be made from endoskeletal or external bones such as antler or tusk. There are several alternatives to mammalary bone seen in nature; though they have some similar functions, they are not completely functionally analogous to bone. Exoskeletons offer support, protection, and levers for movement similar to endoskeletal bone. Different types of exoskeletons include shells, carapaces (consisting of calcium compounds or silica) and chitinous exoskelotons. 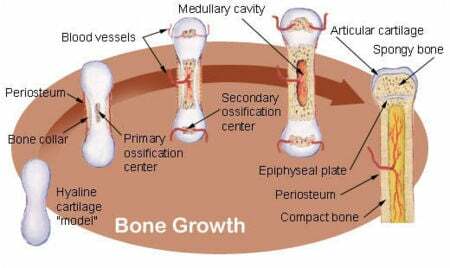 Diaphysis The long, relatively straight main body of the bone; region of primary ossification. Also known as the shaft. epiphyses The end regions of the bone; regions of secondary ossification. epiphyseal plate The thin disc of hyaline cartilage between the diaphysis and epiphyses; disappears by twenty years of age. Also known as the growth plate. A good basic overview of bone biology from the Science Creative Quarterly. This page was last modified on 15 June 2016, at 19:34.